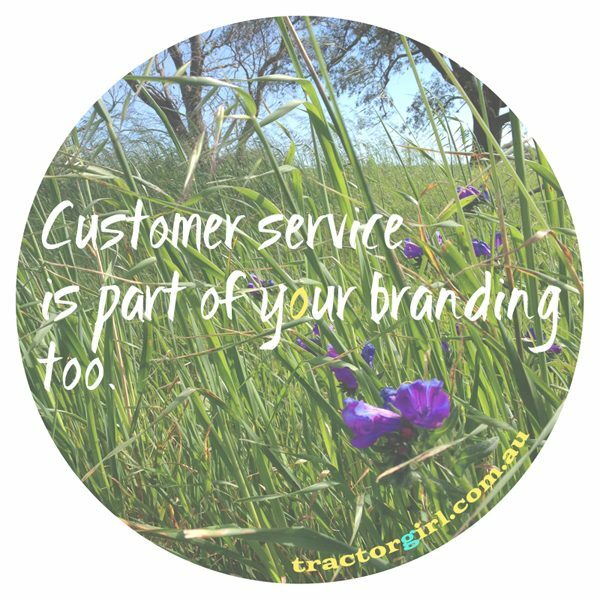 Customer service is part of your branding too. You know all those pretty visuals you’ve got for your branding? It ain’t worth a scrap if you don’t treat your customers right. Yeah yeah nup; in the last few days I’ve been witness to some fairly unpleasant interactions. Like at the takeaway counter when a customer queried his change, and the embarrassed sales assistant spent a silly amount of time fluffing over a calculator, then finally and hurriedly shoved the money into his hand and simply looked away. He was polite, she was SO not. Not even a quick “sorry”. I mean, let me know how long it’s actually going to take and I will happily organise my life around that – I have plenty of things to do. Don’t coddle me along with a vague half-truth (because of course, hours are less than days and in that sense, no it’s not a long time). But now, I’m peeved because they weren’t straight with me, and made me late. Always, always, put yourself in your customer’s shoes and think what they’re thinking. And yes, the same goes for me. I had an unhappy customer a short while ago. I was mortified. I wrote to her, explaining what we’d done and what she’d achieved, offered a couple of ways to rectify the problem, and sent her a copy of my e-book. But she was dismissive and fairly ungracious about the situation, and demanded a refund. Ouch. That REALLY hurt. Not the refund of course, but the fact that I had disappointed someone so badly. Was I really so hopeless at delivering the service? But after going through some angst and thinking about what the actual problem was, I realised that it boiled down to the fact that her expectations of what she was getting didn’t match with what I was offering. And so in that sense, yes it’s my fault because I didn’t make it clear what she would get. When I delivered something different to what she was expecting, she got cranky. Now, I’m re-writing my sales copy so that there’s no mistaking what’s on offer. I’ve already re-written my intro to this service so everyone’s clear from the get-go. Everybody wins from this – I get the right customers, and they get exactly the service they’re wanting and expecting. So the moral of these stories is, at EVERY interaction with your customer, try and think what they’re thinking. Because if you don’t… unhappy customers. They won’t come back. And they’ll tell their friends about their bad experiences. And these interactions start early – not when they’re actually putting money on the counter, but when they first clap eyes on you. When they first see your website. When they see your happy, smilin’ face in your profile shot. When they read your About page. When they read your sales copy. When they read your testimonials. Those interactions continue throughout the transaction. And at the end – how can you delight your customer, so that they become repeat customers and raving fans? So that they talk about you with a happy face, and recommend you to their friends? To know what’s in their heads at every turn of the transaction might seem like an impossible task. But it’s so much easier if you know exactly who your ideal customer is. Who are they? What are they looking for? What are they aspiring to, and how can you help them achieve that? And remember, every unhappy customer is a chance to learn, to improve, so that your next customer experience is a wonderful one.